By default, your Hotmail account displays a neutral avatar (see screenshot) for your Windows Live profile until you choose a picture. Your profile picture is displayed not only in Hotmail, but also in various other Windows Live online services. Change your Hotmail picture, and this will affect all the Windows Live services you use. But, as we'll show you in this tutorial, you can select which people can view your Hotmail picture, to guarantee your privacy. This tutorial will explain how to change Hotmail picture, which considerations to bear in mind when choosing a picture for your profile, and how to control and limit the visibility of your profile picture by other Hotmail users (and/or other Windows Live services' users). To change the Hotmail picture of your Windows Live account profile, locate your profile image (neutral avatar), generally displayed in the top right corner of any Hotmail window. If the current page shows multiple profile pictures, find the one flanked by a downward pointing arrow: this indicates the presence of a dropdown menu. Click on your profile menu, and choose Change picture (careful not to accidentally hit the Sign out link). 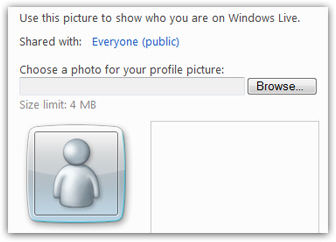 Hotmail will redirect you to the "Your picture" screen (" Use this picture to show who you are on Windows Live "). From there, you are able to add and change profile picture (by uploading it), create or edit your privacy settings, etc. If you do not want or need to restrict the visibility of your profile picture, you can directly skip to the next section: upload your Hotmail profile picture. The first option to configure (or re-configure) when changing your Hotmail picture, (used in Microsoft's entire Windows Live ecosystem), is to decide who should be able to see it (as opposed to seeing a neutral avatar instead). 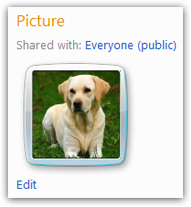 By default, Hotmail shares this picture with everyone: notice, next to Shared with, a "Everyone (public)" link. Click on it to restrict the visibility or your profile picture. Hotmail will load the "Select who can view your picture" screen, which is divided in three sections: under Public and networks, you can choose to let Everyone (default) see your picture, or people in your network. 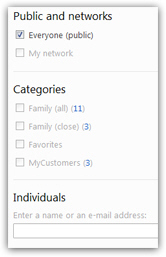 Under Categories, Hotmail displays all the contact categories (distribution lists) you have created: to be able to selectively share your profile picture, uncheck "Everyone (public)", and check the checkboxes corresponding to those with whom you want to share your picture. You can select to share your Hotmail profile picture with one or all your contact groups. 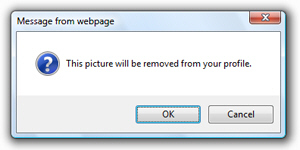 Once you are done, click Save to return to the previous screen and upload your picture. Hotmail lets you upload a profile picture of up to 4 Mb (megabytes), which means that most high resolution photos from a digital camera will be small enough. Click on the Browse button, and a file picker will open, allowing you to choose an image from your hard drive; navigate and pick the image you want to use, and click on the Open button (or double-click on the picture you wanted). If the picture is not completely square, Hotmail lets you "crop" the viewable area of the image - simply drag the borders visible on the preview picture on the right. 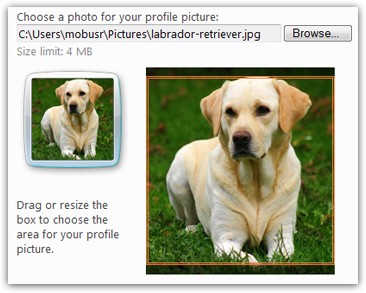 Now that you have preview your profile picture and configured its sharing settings, click Save. This immediately changes your Hotmail picture, as well as the picture displayed for your profile in all other relevant Windows Live services. Hotmail redirects you to your profile page, where you see your new picture (notice that, from there, you can also edit the sharing settings, and the picture itself). In the second screenshot, notice that Hotmail now displays the photo we just uploaded inside the sign out link, in the top right corner of the screen.